This funny shirt reads "I'm a squirrel trapped in a human's body." Available for men as t shirts and sweatshirts, and for infants as an infant bodysuit. The shirt's text says it all. But the barbed wire adds a bit of a rough and tough element to this fine example of rodent humor. 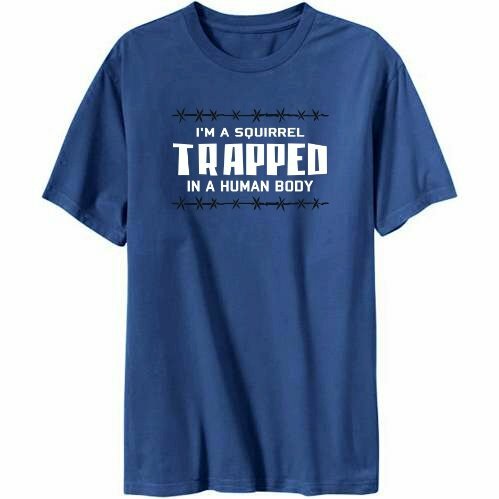 Though we all know someone who could use this shirt, it raises a question: aren't we *all* just squirrels trapped in human bodies? The wearer of this shirt can warn the world around them of their natural tendencies. Help yourself, your friends, and your family members release their inner squirrels with this funny t shirt. If you like this shirt, check out the version with a skull.